…in the first 60 pages. I’ve never really liked reading books. I think it came from all the assigned reading for testing, stickers and book reports when I was young. Not until grad school did I actually read (almost) everything assigned and that was because I enjoyed it and understood the value of the content to my work. So, you can understand why I’d pretty much given up on the written word, especially these days where anything I want/need is a click away and most authors compile their books from other books or test all their material on blogs (which makes the print version outdated anyways). 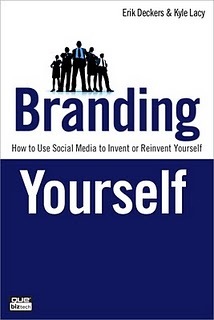 So a few weeks ago I picked up a copy of Branding Yourself, a new book by Kyle Lacy and Erik Deckers. I went to the book launch and picked up a copy to support them because they’ve both contributed to my learning and efforts – it’s the least I could do. Oh, and they’re really good at what they do. Need proof? Check out the blogs and companies they’ve built by practicing what they preach. However, in all reality I didn’t think there would be anything in it I couldn’t read on their respective blogs. I was wrong. First, I haven’t read every post and tweet they share and never could. Second, the book is choc full of awesomeness. It’s fun, direct and honest. The first part of the book is mostly about blogging – hence the focus below. Next up is LinkedIn, Twitter, Facebook and Measurement. Then Networking, Promotion, Speaking and Publishing. Whew. So, here are 8 things I’ve learned in the first 60 pages. For 1000 more – buy the book. Lots of people enter the online world looking for what they can ‘get’ out of it and its people. Enter the world offering yourself, your energy and your services. The benefit will come later and naturally. It seems it’s better for SEO as spiders search a page right to left. Done. There’s an ongoing debate in the blogosphere about writing longer, quality posts with good content versus cranking out posts regularly that aren’t as planned or detailed. They say to strike a balance. I’m trying to lean towards quality. There’s a great discussion of keywords which frankly, I knew little about. I’m writing this blog to share my views and opinions on issues. When I started I thought little about people ‘finding me’ because I really felt the blog was more for me than for others (and writing to be ‘found’ sounds vain). But the reality is – if I hope to impact anything, my blog needs to be found, read and shared…and it’s ok to take some simple steps to make the ‘finding’ easier for folks. Are you kidding? No? Ok, fine. I guess if you’re going to brand yourself and enter the online conversation or ‘cocktail party’ you do have to move tables once in a while and not wait/hope for people to come to you. I’m going to start w/ 5 a week and build to 3 a day. Oh, and I should get up earlier. These are great tips. I’m definitely going to get to work!! Thanks for the insight on Kyle and Erik’s new work, Nathan. I especially like the SEO cleverness of changing the sidebar from the left to the right… more importantly, it’s just more usable, and it’s a technique I’m looking at for some of my work. Also, using keywords for anchor text, is definitely a real SEO plus.